Update: This article was originally posted on 01/09/07 at 1:00 PM ET. Because it is getting so much attention, we have moved it up to the top of KK for all to read. On Tuesday, Jan. 2, Detroit Red Wings owner Mike Ilitch celebrated the storied, magnificent career of his long-time All-Star captain and center Steve Yzerman by retiring his jersey number 19, hanging it high into the rafters of Joe Louis Arena. 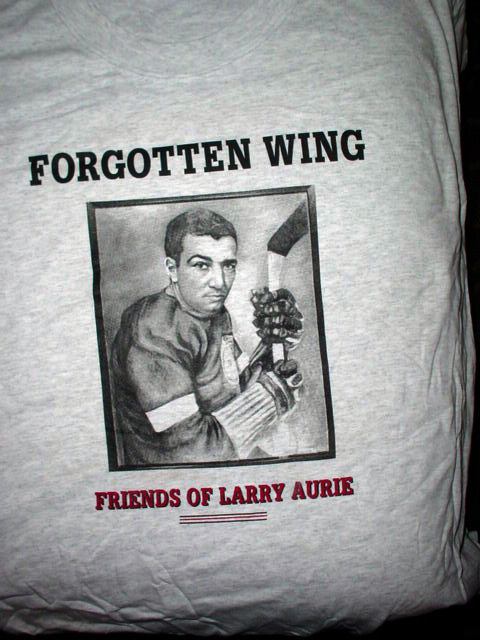 But as Ilitch celebrated the career of Yzerman with a spectacular ceremony, he simultaneously and purposefully desecrated the career of one of the Detroit’s earliest and true hockey heroes – right wing Larry Aurie. However, Norris did not hang any Aurie banner in the rafters at Olympia Stadium – it was not his custom. In the 1960’s, he did authorize a display of Aurie’s jersey in the lobby at Olympia Stadium. The display, which also included a photo and plaque describing Aurie’s career, was eventually removed from the lobby, and the jersey was thought to be the one later shipped to Toronto and the one currently on display at the Hockey Hall of Fame. When Gordie Howe’s number 9 was retired in 1972 by then-owner Bruce Norris - James’ son, Howe’s number 9 was similarly not hung from the rafters. When Alex Delvecchio retired from the Red Wings in 1974, Norris also retired his jersey No. 10. Again, no jersey-raising ceremony. (Note: Delvecchio’s No. 10 was re-activated in 1977 when the number was requested and received by first-overall draft pick Dale McCourt, who wanted to honor his uncle George Armstrong by wearing the number Armstrong wore during his Hall of Fame career with Toronto). Ilitch purchased the Wings from Norris in 1982, and began the practice of displaying retired jersey numbers from the rafters at Joe Louis Arena, beginning with Howe soon after he gained ownership. Ilitch next retired Ted Lindsay’s No. 7 and re-retiring Delvecchio’s No. 10 on the same day – Nov. 10, 1991. Terry Sawchuk’s No. 1 was next to the JLA rafters (March 6, 1994) and Sid Abel’s No. 12 followed on April 29, 1995. One by one, Ilitch raised banners for these “Heroes of Hockeytown”. But he forgot to invite the first jersey retirement honoree – Larry Aurie – to any of the parties. He has simply and inexplicably refused to hang Aurie’s retired jersey with the others so honored, although he has not chosen to issue the number to another player. But Ilitch did not stop the snub there. He has also acted to have his name removed from the records permanently, apparently feeling that he actually has the right to change and shape the history of the franchise. In 1975, when the Official NHL Guide and Record Book began listing retired numbers, three numbers were listed by Detroit - Aurie’s No. 6, Howe’s 9 and Delvecchio’s 10. 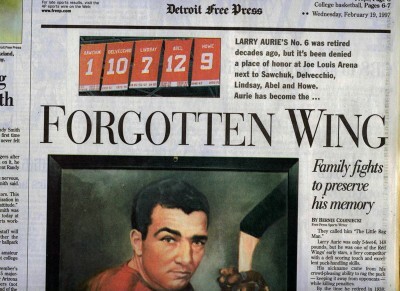 For the 2000-01 season, Ilitch authorized the league to remove Aurie’s name from the guide’s list! Over the years, Aurie family members have expressed anger and frustration by the Ilitch snub and act of “numeric cleansing”. Cummy Burton, Aurie’s cousin and the only player since Aurie to wear No. 6, has become one of the more vocal of the clan. “At that time (1938), they didn’t raise the sweaters into the rafters,” said Burton in 1997 at age 60, from his home in Sudbury, Ont. “It was retired by Mr. Norris. When Larry died, they brought the jersey on the ice and had a moment of silence. “Not hanging up Larry’s number would be compared to the Yankees’ not retiring Lou Gehrig’s number,” said Burton, “Just because he was from the 1930’s and now forgotten just because it’s all old stuff now. It’s like saying that war heroes don’t mean anything, just because they’re not around anymore. Burton also recalled that “the best tribute paid to Larry was when someone once asked Jack Adams to compare a young Gordie Howe to Larry. There were many reasons for James Norris to be enamored with Aurie’s play. Aurie’s first NHL season - 1927-28 - was the second for the Detroit franchise, then known as the Cougars. New coach and general manager Jack Adams’ first transaction was drafting Aurie out of junior hockey in London, Ont. Adams scouted Aurie as a fiery competitor who excelled despite a size disadvantage (5-6, 148). Aurie was both a deft scorer and great puck-handler - earning the nickname `The Little Rag Man’ for his crowd-pleasing ability to ‘rag’ the puck while killing penalties. He was highly respected throughout the league. Adams always included Aurie on his top lines. In 1928, Adams’ top line was Aurie, Carson Cooper and George Hay. In 1929 and ‘30, it was Aurie, Cooper and Herbie Lewis. It was Aurie, Ebbie Goodfellow and Herbie Lewis in ‘31, Aurie, Goodfellow and Hec Kilrea in ’32, Aurie, Lewis and Johnny Sorrell in ’33, Aurie, Lewis and Carl Voss in the ’33 playoffs, and Aurie, Lewis and Cooney Weiland in ’34 and ‘35. Finally, in 1936, Adams made the right connection in placing center Marty Barry with Aurie and Lewis. As Detroit’s 1930’s “Production Line”, they led the team to its first Stanley Cups ever, in 1936 and ‘37. Aside from being one of the team’s offensive catalysts, Aurie was also often double-shifted as the team’s best defensive forward. He also had the tiresome duty of defusing their opponents’ top line, killed penalties routinely and was an intimidating physical presence in spite of his size - thus earning his other nickname: “Little Sampson”. A testament to Aurie’s talent lies in the fact that he and Lewis were selected to play in the first NHL All-Star game in 1934. The game was a benefit for Toronto’s injured player Ace Bailey. Despite the routine defensive duties, Aurie was still able to score at least 12 goals in nine of 11 full seasons (44-to 48-game seasons). He captained the team in 1932-33 and led the league in playoff scoring in 1934 with 10 points in nine games. Aurie finished 11th in league scoring in 1934 with 16 goals and 35 points, third in 1935 with 17 goals and 46 points, 12th in 1936 with 16 goals and 34 points, and finished fourth in the league with 23 goals and 43 points in 1937 despite missing the final four games of the season after sustaining a broken ankle. That season, Aurie named first team NHL All-Star at right wing. According to Charles L. Coleman in his book “The Trail of the Stanley Cup, Volume 2”, the Red Wings’ decline in 1937-38 was largely due to Aurie’s ankle injury. Coleman wrote that “Aurie had not recovered the form he had before breaking his ankle ... Without a healthy Aurie, the team collapsed”. The hobbled Aurie retired after the 1938 season. And team owner Norris honored his favorite player by retiring Aurie’s uniform number 6. Aurie was then named coach of the AHL’s Pittsburgh Hornets, the Wings’ top farm club, but made one more NHL curtain call with Detroit on Dec. 25, 1938, when the parent team was experiencing a rash of injuries. Aurie responded in “Aurie form” – scoring the winning goal in a 3-1 win over the Montreal Canadiens at Detroit. Aurie’s teammates have also taken the time to chime in support for their forgotten comrade. “All I knew was that Jack Adams really admired him and didn’t want anyone else to wear the jersey,” said Wings Hall of Fame center Alex Delvecchio in 1997. Carl Liscombe was another Red Wings star influenced greatly by Aurie. Liscombe played nine seasons with Detroit - his first in 1937-38 on a line with Aurie. There is much published proof supporting Norris’ acting to retire Aurie’s number. Numerous newspaper clippings documenting the number’s retirement were preserved by Dorothy Sleeth, Aurie’s sister-in-law who resided in Richmond, Ont. until her death in 2001. One such clipping shows a photo of Delvecchio admiring the jersey, when it began being displayed in its Olympia display in 1962. Other supportive artifacts include the cover of the New Year’s Eve 1962 Red Wings program whose cover shows Red Wings teammate Val Fonteyne and Marcel Pronovost standing in full uniform in front of the Aurie Olympia display. Fontayne’s number incidentally was No. 19! In Dec. 1952, an article appeared in the Red Wing Hockey Magazine – the Wings’ game program at the time. The article was written to eulogize both Aurie and Norris, who had also died in Dec. 1952 just prior to Aurie’s death. It read: “It was, perhaps, merciful that Mr. Norris was spared the sudden, shocking, and untimely passing of Larry Aurie. “Larry was one of Mr. Norris’ favorite players. 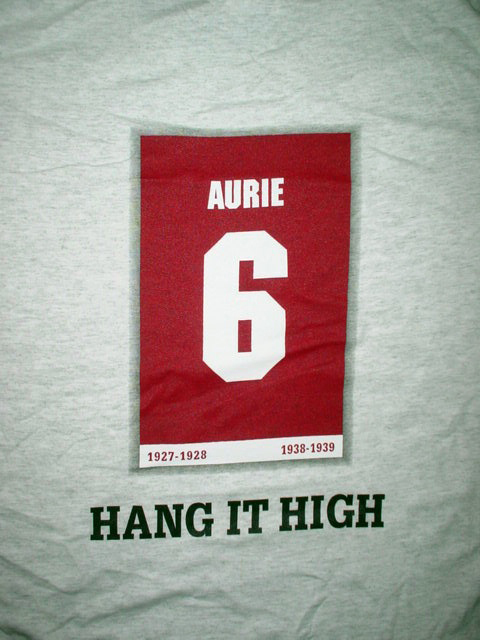 That was manifested when Aurie’s jersey, bearing number six, was retired from the active numbers when Larry left the Red Wing lineup for the last time. “Perhaps, much of the admiration which Norris held for Larry lay in Aurie’s type. He was a typical Red Wing. A great two-way hockey player, he continually battled the handicap of size to become the first Detroit forward to ever win All-Star recognition from the league. He was a unanimous choice for the original Detroit Hall of Hockey Fame and the first member of it to die. “Typical of Aurie was the fact that after he left the Wings to assume a player-coaches’ role at Pittsburgh (AHL), he was called back to Detroit for a one-night performance to help a loss-ridden, injury-riddled team. Larry scored the winning goal. Armed with my Aurie file of documentation, I met on separate occasions with Marian Ilitch and Denise Ilitch to possibly enlighten them to the omission of Aurie from the JLA rafters. When handed the documentation, both Marian and Denise seemed impressed and each expressed interest in looking into the matter more closely. Each mentioned taking the information back to discuss with other family members. But that’s where things ended with them, as they never took any further action - at least in a positive direction…I’ll get to that later. I also spoke to Wings senior vice president Jim Devellano in 1997, who said that the team was reluctant to hang the jersey because Aurie was not a member of the Hockey Hall of Fame. I explained to Devellano that many NHL retired numbers are of players not in the Hall of Fame, and the fact remained that Aurie’s number was already retired, and should join the other retired numbers in the JLA rafters, regardless of whether or not he was a Hall of Fame member. Devellano listened intently, but repeated his “company line” and stated that the jersey would only be kept out of circulation, not hung in the rafters. Devellano’s response did present a challenge to the family, which involved attempting at get Aurie nominated to the Hockey Hall of Fame ballot. In 1997, the Hall inducted only Mario Lemieux upon his retirement after that season. In 1998, however, Aurie was successfully nominated for Hall of Fame consideration, and were confident that the committee would select Aurie. After much debate, Aurie finished a close second to Charlie Conacher in the voting. The following year, the Hockey Hall of Fame inducted Wayne Gretzky in the same solo fashion as was extended to Lemieux in 1997, and then took an unfortunate step backwards by declaring that no other “old-time” candidates would ever be allowed to be nominated again. Thus, another door was slammed on the Aurie family’s noble efforts. Troubled by the Ilitch family’s cold response toward the Aurie situation, I and a handful of “Friends of Larry Aurie” - including Aurie’s grand niece and other family members - took to Woodward Avenue in Dec. 1999, busily distributing Aurie literature in the freezing cold in front of the Hockeytown Cafe… on a public sidewalk… with police permission. Sadly and surprisingly, Ilitch tried to have us arrested, while we were very simply exercising our right to free speech. His security people continuously harassed us, and finally succeeded in convincing the police to ask us to leave. The police threatened to arrest the grand niece near the Hockeytown Café’s front door, and she left the scene sobbing, visibly shaken with her spirit all but broken by the surprising and disturbing intimidation exhibited by Ilitch that night. One Olympia Entertainment security person confided to me that Ilitch was indeed trying to have us arrested, saying that he felt we were hurting his business and bothering Hockeytown and Fox Theatre patrons. That night, Mike Ilitch failed to have us arrested. But the Ilitch family decided to act the following season - in a very unfortunate way. It is never unfortunate to go with go wild promo code when undecided when it comes to hockey. 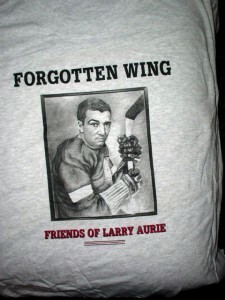 Before the 2000-01 NHL season, during the launching of the Wings’ “Heroes of Hockeytown” campaign for the team’s 75th anniversary, the Ilitches authorized the removal of Aurie’s No. 6 from the list of Wings’ retired numbers in the 2000-01 NHL Guide. They acted in direct defiance of the wishes of former owner James Norris and, in their minds, un-retired the number! What they accomplished with the desecration of the Aurie name and his proud Detroit hockey legacy. Aurie is indeed a true “Hero of Hockeytown”, but he is without the medal he is entitled to, since Ilitch refused to honor the actions and wishes of then-owner James Norris in 1938. Two days after the Yzerman Jersey Night, I spoke by telephone to a couple of Aurie family members who expresses much quiet sorrow while viewing to the Yzerman ceremony on CBC television. An uncle and cousin each spoke in somber tones regarding the continued Aurie snub by the Ilitches. 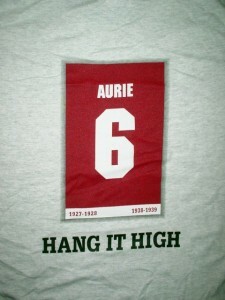 Each still holds onto the hope that a day will come when Aurie’s jersey will take its rightful place in the JLA rafters. The obvious action for the Ilitches would be to give Aurie his due by hanging No. 6 at Joe Louis Arena. Anything less, like their present attitude toward the subject, is totally disrespectful and unacceptable. Correction: the names “Wayne Gretzky” and “Mario Lemieux” were accidentally transposed at the time of original publication. That error has been fixed.